Heller Search Associates is a retained executive search firm with an industry reputation for identifying and recruiting superior information technology leaders. We place IT professionals at the C-level (CIO, CTO, CISO, CDO) as well vice presidents and directors in all areas of our clients’ technology operations. Without a doubt, the CIO role is unique. It brings together a broad and often contradictory set of responsibilities that are essential to a company’s operations and growth. What’s more, as digital technologies transform the very fundamentals of most businesses, the CIO role is constantly evolving. 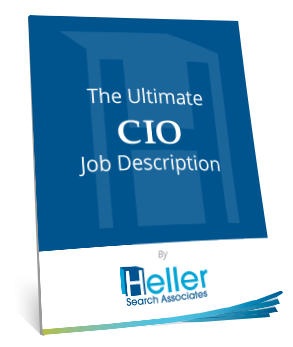 More than half of the searches that Heller Search completes are for the role of CIO. 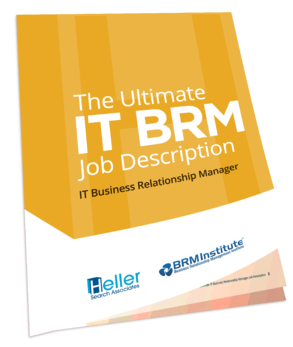 Download our Ultimate CIO Job Description. Due to the widely publicized rash of data breaches, ransomware and denial-of-service attacks in recent years, security professionals are in extremely high demand. Some CISOs have a background in governance and risk; others are highly technical; some report to the CIO; others report to risk, legal, or directly to the CEO. 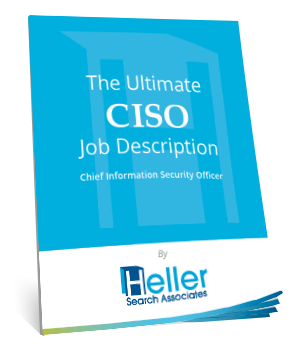 Download our Ultimate CISO Job Description. With digital technologies changing every facet of their business, many CEOs are looking for someone to turn the pockets of digital innovation that are happening all over the company into one comprehensive strategy. Some Chief Digital Officers have a technology background, some come from marketing, and some have run business units. But regardless of the background, the Chief Digital Officer is an enterprise leader who is strong on vision, influence, and partnerships, and has the communication skills and executive presence to keep the executive committee focused on the future. When a company’s leaders are prepared to fully realize the competitive edge of data, and make a long term commitment to the organizational and cultural changes required to do so, they are ready to hire a Chief Data Officer. The Chief Data Officer is responsible for the governance of data and the treatment of data as a critical asset. Chief Data Officers typically report to the CEO and are a critical partner to the CIO. With titles including VP of Infrastructure and Operations and CTO, this resilient executive reports to the CIO and manages data centers, help desk, networks and every other facet of a company’s IT operations. With the emergence of infrastructure-as-a-service and other cloud technologies, CIOs across the industry spectrum are refreshing their infrastructure talent. These days, the “plumbing” of a company’s IT stack is going through tremendous change, as are the professionals who are responsible for it. IT infrastructure and ops leadership involves more orchestration and vendor management than hands-on technology work. Today’s application development leaders do more than churn out code. They lead teams in Agile development processes, they create mobile solutions, and build strong relationships with their business partners. They are transformational executives with business acumen and the ability to drive change. These executives are often in the prime position to succeed their boss, the CIO, so having a strong applications VP or director is a long-term strategy. 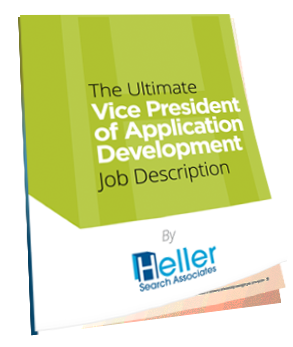 Download our Ultimate VP of Application Develop Job Description. Technology organizations – whether in retail, financial services, healthcare, or any other industry – are starting to think about technology as a product, rather than a project or an application. Critical to this shift is the product development leader, that professional responsible for ensuring the release, adoption, and value of a technology solution. Product development leaders understand technology, marketing, ROI and how to lead nimble, cross-functional, agile teams. Often a subset of application development, e-commerce, digital, and mobile technology executives partner with the heads of sales, marketing and e-commerce to develop and deliver customer facing technologies. While most CIOs prefer that their e-commerce and digital technology leaders have a strong development background, more and more of these professionals have come up through marketing, but have enough technical acumen to be effective in their IT roles. Data is quickly becoming a company’s most important asset. Effective VPs and Directors of business intelligence (BI) and data analytics have the right blend of technical, business, and partnering skills to provide the technical tools and strategic guidance to turn data into intelligence. These IT professionals are critical partners to a company’s Chief Data Officer, who manages enterprise-wide data governance. BI and data analytics IT professionals report up to the CIO either directly or via the head of application development. Successful enterprise architects bring a lot to the table. They have expertise in every layer of the technology stack, the ability to direct a matrixed pack of entrenched and siloed technologists, a deep understanding of the business, and the interpersonal skills to sell concepts like service-oriented architecture to business executives who don’t fully understand IT. Deep technologist meets business strategist meets influential manager meets expert communicator. It's a tall order, but with the array of technology options available on the market, CIOs need someone looking after the integrity of their architecture.